I n September 2015 our Sports Therapist Annabel took on the tough yet amazing challenge to scale the 5,895 metre Mount Kilimanjaro. Not only is Kilimanjaro the highest peak on the African continent, it is also the tallest free-standing mountain in theworld. The trek to the summit consisted of high elevation, low temperature and occasional high winds making it a difficult and dangerous trek. Altitude sickness can also cause many difficulties along the way including; shortage of breath, headaches, dizziness, exhaustion, and nausea. 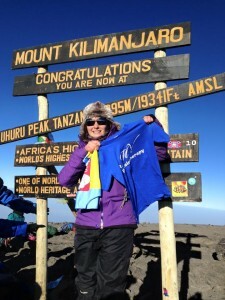 Annabel’s challenge consisted of a 5 day trek to the summit and a 2 day decline. The route that she took is sometimes known as the coca-cola route as it is the oldest path on the mountain and travels through rainforest up to the lunar desert and volcanic ash at the crater. The trek was extremely difficult with the group suffering from headaches, nose bleeds, sickness and stomach upset. Annabel suffered from aloss of altitude over 4000m and went off her food for 2 days which isn’t great when your exerting yourself. However she reported that the trip was an amazing experience and although she wouldn’t do it again, would definitely recommend it to others who want a challenge. Below is a video montage put together by Annabel to show her amazing journey up to the Roof of Africa! Hope you enjoy it! This year Mike Varney Physiotherapy has chosen to support Children With Cancer UK, with Becky running the 2015 London Marathon for the same charity. Around 2,400 children and teenagers are diagnosed with cancer every year in the UK. Children with Cancer UK is the leading national children’s charity dedicated to the fight against all childhood cancers.Every donation whether big or small will help make a difference in the fight against Children’s Cancer and give those children who are suffering from this terrible disease the childhood they deserve. Annabel’s sponsorship page is still open till December 2015 so if you would like to continue to donate then please click here to visit her Just Giving page.